The remains of the old church of Ayios Nikolaos Vounenis, oriented more or less east-west, are situated on a plateau on a hillside at the former tsiflíki Karatsádagli. 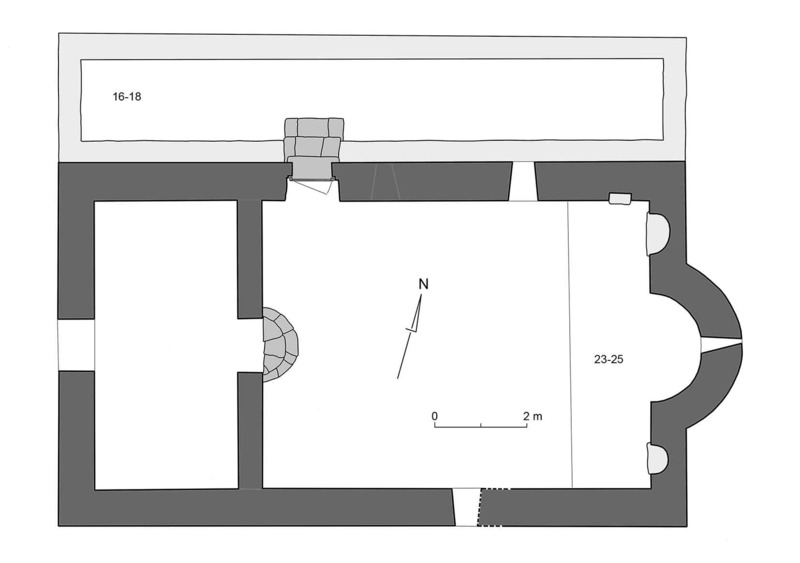 It is a rectangular building, 7.90 m wide and 13.70 m long, with an apse at the eastern side which protrudes 1.20 m; the total length being 14.90 m. The interior is divided into two parts of unequal area by a cross wall. 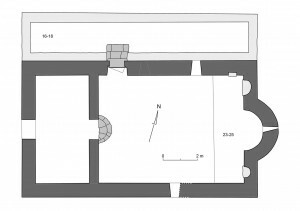 The western part of the interior – the γιναικωνίτης, used by the women – lay higher than the rest of the church and could be reached via an opening in the west wall of the church. The state of preservation is lamentable. The roof of the church has completely collapsed, perhaps due to the earthquake which struck the area in 1980. The church of Ayios Nikolaos Vounenis, dedicated to a Thessalian saint, built at a former Ottoman tsiflíki with spolia from the Classical-Hellenistic-Roman-Byzantine site on Kastráki hill is a remarkable monument in the Almirós plain, intersecting various periods in the history of the local region. It would be worthwhile to protect and preserve the remains of the old church, as a unique witness to the cultural and historical diversity of this area. 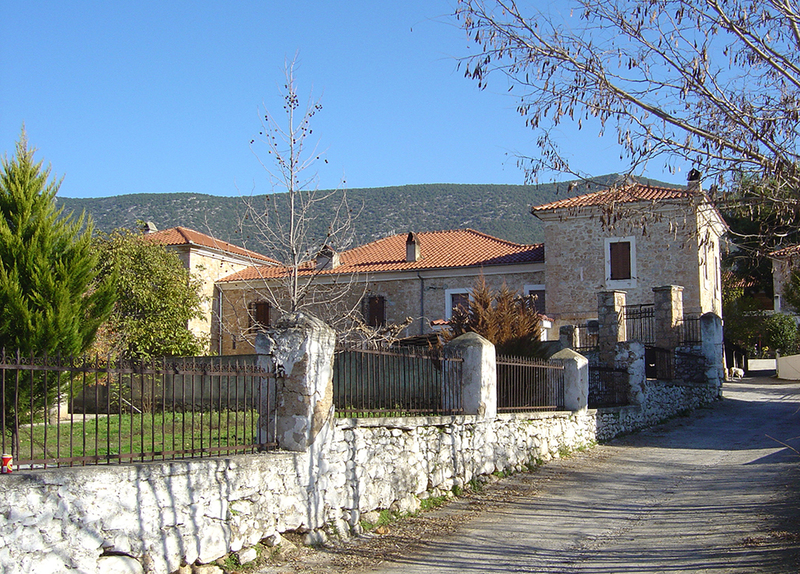 Sites of ‘minor’ importance – remains of former tsiflíkia, small churches, bridges and border fortifications – are important elements of the cultural heritage of Thessaly at a regional or even local level. The conservation of the remains of the church of Ayios Nikolaos could be held up as an example, even if the present state of preservation is deplorable. If this is not an option, then there is nothing left other than to document a Wüstung in the making. 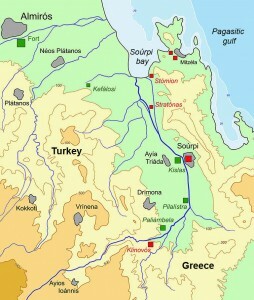 From 1832 until 1881, the first border between Greece and Turkey ran along the line Árta-Vólos, across a remote and poorly known part of Central Greece. A large fort with a Turkish garrison was located south of Almirós, but it was razed to the ground after the liberation of Thessaly in 1881. The headquarters of the eastern border guard of Greece was located in the kastro of Lamía, far away from the Almirós area. A fort in the village of Néa Mitzéla controled the sea border between Greece and Turkey, which ran through the Pagasitic gulf. 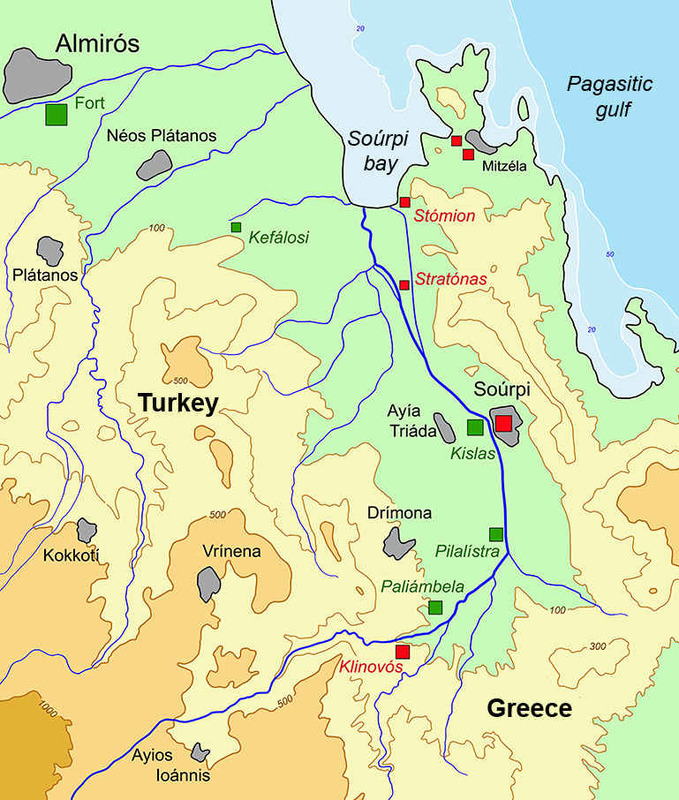 Smaller posts were situated in Loutráki and Stómion to control the inlets of Soúrpi bay. 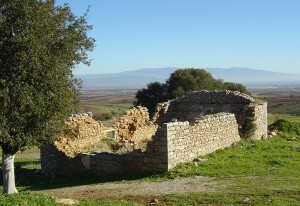 The fort in the centre of the village of Soúrpi is still intact. It consists of a rectangular building with two square towers; the headquarters of the Greek border forces in this area. Small posts along river Salambriás controled the land border between Soúrpi and the foothills of Óthris mountain: the kislas near Soúrpi, the Turkish posts at Pilalístra and Paliámbela, and a Greek post at Klinovós, designed by a Bavarian architect in 1832. Remains of forts, watch posts and water mills, a country lane and a footpath from Soúrpi to Ayios Ioannis, mapped during the survey campaigns of 2000 and 2002, survive to recall the frontier of this turbulent period. It is recommended to signpost the old footpath and to restore and consolidate the fortifications, in order to make visible the border landscape of the 19th century.